Hi Nobody. Have you tried following the steps on our knowledge base about getting started with Synergy? If not yet, click this and follow the steps in that article. Yes, I watched your video. Actually, I am trying to use the "Auto config" option, However, it takes forever to download it. Hi Nobody. If your client has multiple network adapters enabled. It might be trying to look for the client on a different network. 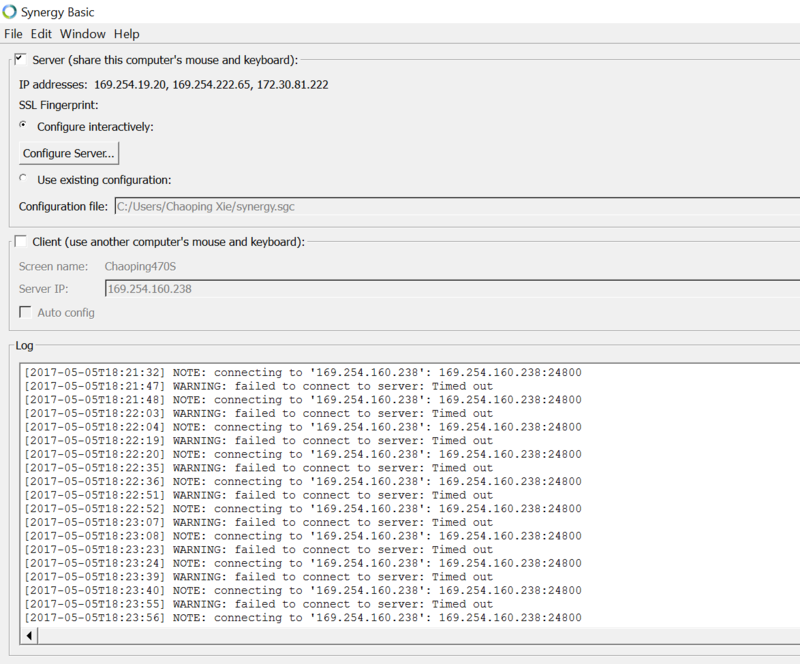 Trying entering the Servers IP address into the Server IP box manually. Have you started the server too? If you did, please send us the logs here. Well. I did start the server. Attached is the snapshot of server and client. I also tried to switch server and client. It did not work either. Disclaimer, I am not an expert in the use and configuration of this software, indeed, I have had it installed for all of an hour or so where its possible that what I profer here may be of help in the short term, please look to Pauls expert help for a formal solution. At any rate, as indicated in the IP Addresses field in your first screen capture, the host you are running your synergy server on has three network interfaces available, two of which are failing to get IP addresses from DHCP, and are subsequently being assigned link-local addresses (169.254.*. *); these are not valid for routed communication. The third network interface on your server has a valid IP address,172.30.81.222. You need to point your synergy clients at that address. So, in the configuration on your Synergy client computers, place the IP address 172.30.81.222 in the "Server IP" field. Further, you will need to tell your Synergy server to use the 172.30.81.222 as its address, so that it doesnt use one of your invalid addresses. Open Synergy on the computer that is hosting the mouse and keyboard you want to share, go to Edit > Settings and put 172.30.81.222 in the interface field, and see if that works for you. Thank you for answering. Unfortunately, I have requested a refund and switched to the Mouse without Boarders, which is much easier to configure and free! But I need to thank you anyway for offering such detailed information. We're sorry to hear that Nobody. Let me just try to provide you a little more detail for that concern. The machine shown on that previous screen shot you sent shows that it has 3 network adapters enabled. First two network adapters show that they have both 169.254.x.x. If the client is unable to acquire an IP address from the DHCP server, it uses APIPA to automatically configure itself with an IP address. The IP address range is 169.254.0.1 through 169.254.255.254. A client uses the self-configured IP address until a DHCP server becomes available. That means that only the third network (172.30.81.222) where your machine is connected to should be the only network where you can connect the other machine. If you see an IP address on top of your client that starts with 172.30.x.x (where x can be any number from 0-255), then you should be able to connect both machines. If in case you'd change your mind and would want to try Synergy again, we'd be here to assist you.